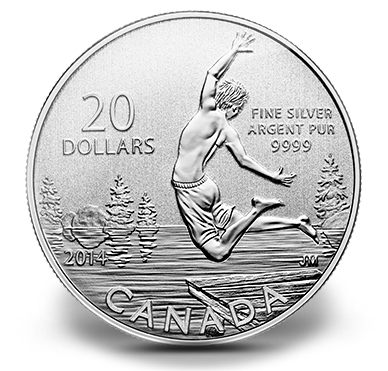 The Royal Canadian Mint's popular Exchange $20 for $20 program features its newest release with the recent debut of the 2014 $20 Summertime Silver Coin. Like its program predecessors, the Summertime Silver Coin is struck from 99.99% pure silver and is sold to the public at its legal tender face value of $20. As the name of the coin suggests, the reverse features a design emblematic of the theme of 'Summer.' The theme is portrayed in a design by John Mantha. Shown on the reverse is a traditional summertime activity - swimming in the lake. A boy is depicted as he jumps off the end of a dock about to land in the water. Inscriptions of CANADA, 20 DOLLARS and FINE SILVER ARGENT PUR 9999 add to the image. Susanna Blunt's effigy of Queen Elizabeth II graces the obverse. Inscriptions include ELIZABETH II and D G REGINA. All but the most recent program issues have sold out. 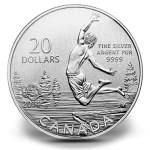 While still available, the Summertime Silver Coin may be ordered directly from the Royal Canadian Mint via its website of www.mint.ca or by calling 1-800-267-1871 (Canada), 1-800-268-6468 (US) or 613-954-2626 (International). Each coin ships in a protective sleeve attached to an illustrated presentation card. Maximum mintage is only 200,000.